Isn't this often how an idea is sparked? You see something and your mind gallops off in an unexpected direction. I love it when this happens, and I'm thankful that it happened to Stephenie because it resulted in the Helix Scarf, a rippling, ruffling bit of stylish beauty. 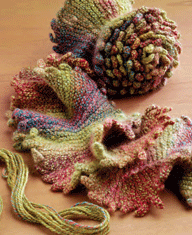 The Helix Scarf Came to my attention as part of a Spin-Off Magazine reader challenge. Spin-Off does poses challenges several times a year and it's so much fun to see what readers come up with. 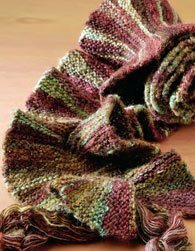 The editors choose a pattern and then challenge readers to come up with their own versions, spinning their own yarn to make the pattern, and adding mods as they see fit. I'm in awe of the results of these creative readers, so I thought I'd share some of the finished projects to inspire you, too. All of the entries were knitted using handspun yarn, but if you're not a spinner, you can knit Helix with your favorite commercial yarn, of course, or pick up some beautiful handspun at your LYS! Elizabeth Souza's Helix Scarf. 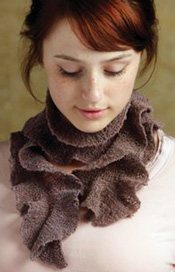 Elizabeth used baby camel and silk fibers for her scarf. So soft! Fall Foliage by Lori Lawson. Lori used a picot edging to add a bit of whimsy. New Beginnings by Sarah Wilson. Sarah spun up a worsted weight yarn for her Helix variation. Gilding the Lily by Leslie Ann Hauer. 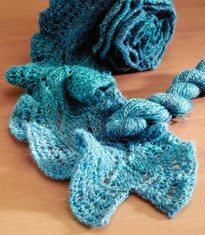 Leslie added a simple lace pattern to her Helix Scarf. Download the Helix Scarf to see the rest of the fantastic entries, too (the pattern begins on page 2 of the download). You'll see scarves knit out of various yarn weights, and there's a pattern for each of the variations challenge participants came up with! 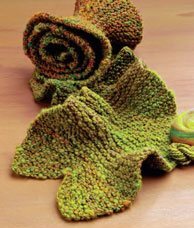 This challenge is just one of the fun and exciting articles Spin-Off offers to knitters. Subscribe now so you don't miss out on any upcoming challenges or unique knitting patterns.